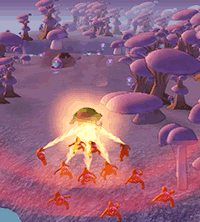 A stampeding herd of Stompies can be quite formidable – destroying buildings and pushing Robots around. The power of their attacks is based on the number of Stompies in the immediate vicinity of the point of impact. Keep your herd tightly packed to maximise your destructive power and prevent lone Stompies from being picked off by the Robots. Shake the Wii Remote over a building’s base to help your Stompies shake down buildings faster. When pushing Robots, note that the Robot will be pushed out in the direction of the Wii Remote’s Cursor relative to the point of impact. In this way you can aim to push Robots out of your way, or into a lake.